This breathtaking and lavish Lincoln Center Theater production reinvented the classic Rodgers & Hammerstein show, swept the 2008 Tony Awards, played to sold-out houses on Broadway, and was televised across America. Set on a tropical island during World War II, this is the sweeping romantic story of two couples, threatened by the realities of war and by their own prejudices. Its portrayal of Americans stationed in an alien culture in wartime is as poignant today as when it first thrilled audiences in 1949. Considered one of the finest musicals ever written, the score includes Some Enchanted Evening, I’m Gonna Wash That Man Right Outta My Hair and There is Nothin’ Like a Dame. 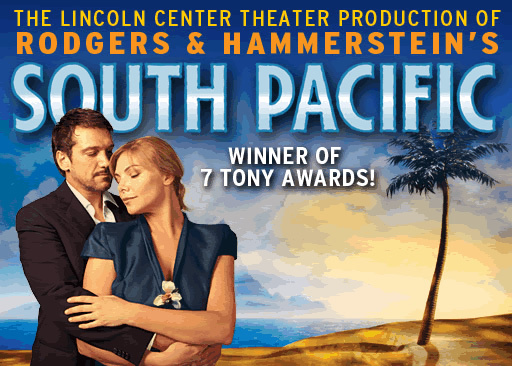 Promenade is co-producing South Pacific with Genesius Theatrical Productions, Robert Boyett Inc, the Ambassadors Theatre Group and Bob Bartner.